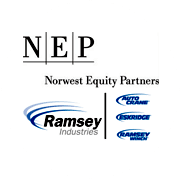 Tulsa, Oklahoma – Ramsey Industries (“Ramsey” or the “Company”), a leading manufacturer of service cranes, industrial and commercial winches, planetary gear, and digger drives, is pleased to announce that it has received a significant capital investment from Norwest Equity Partners (“NEP”), a leading middle market investment firm founded in 1961. The transaction closed on November 6, 2017; financial terms were not disclosed. Founded in 1944 by Claude and Rayburn Ramsey as Ramsey Brothers Tool & Die to manufacture aircraft parts, tools, and dies for Douglas Aircraft Company, and through the years Ramsey Winch has maintained the high standards necessary to deliver a premium product. The company stays in tune to the needs of the market, resulting in innovation and new product introductions across consumer, commercial, and industrial applications. Ramsey is today comprised of three wholly-owned branded subsidiaries, Auto Crane®, Eskridge®, and Ramsey Winch®. Each of Ramsey’s brands is a leader in its market segment with a long-standing reputation for safety, innovation, quality, reliability, and performance serving mission critical applications. Driven by a lean, streamlined approach to product development and problem solving, Ramsey products have continued to dramatically improve the energy, mining, utility, and construction industries around the world. Auto Crane® designs and manufactures a comprehensive line of truck-mounted electric and hydraulic telescopic cranes, crane service bodies, crane control technologies, accessories, and mobile solutions for the energy, mining, construction, industrial, forestry, and railroad industries. Eskridge® is a leading designer, manufacturer and marketer of planetary gear drives and anchor drives, digger drives, and multiple-disc brakes. Ramsey Winch® designs and manufactures industry-leading industrial and consumer winches for use in towing and recovery, industrial, petroleum, off-road, and ATV vehicles. NEP and Ramsey complement each other well as they share established business roots and longevity of operations. With a strong and cohesive management team led by John Celoni, Ramsey has built a reputation of having long-standing customer relationships with a diversified supplier base and a sales team focused on working together with channel partners to create successful solutions. Ramsey products are built from innovative, highly-engineered solutions that drive superior performance and much of the Company’s growth plans will be defined by continued innovation, including new product development focusing on market needs, as well as both customer and geography footprint expansion. Ramsey operates two modern facilities; one in Tulsa, Oklahoma, serving as corporate headquarters and production facility for both Auto Crane® and Ramsey Winch®, and one in Olathe, Kansas, where Eskridge® products are manufactured. BB&T Capital Markets advised Ramsey on the transaction; Winston & Strawn provided legal services for NEP; Ally Corporate Finance, ING Capital, and Siemens Financial Services served as senior lenders; and Norwest Mezzanine Partners served as mezzanine lender. More information can be found on www.ramseyindustries.com and www.nep.com.